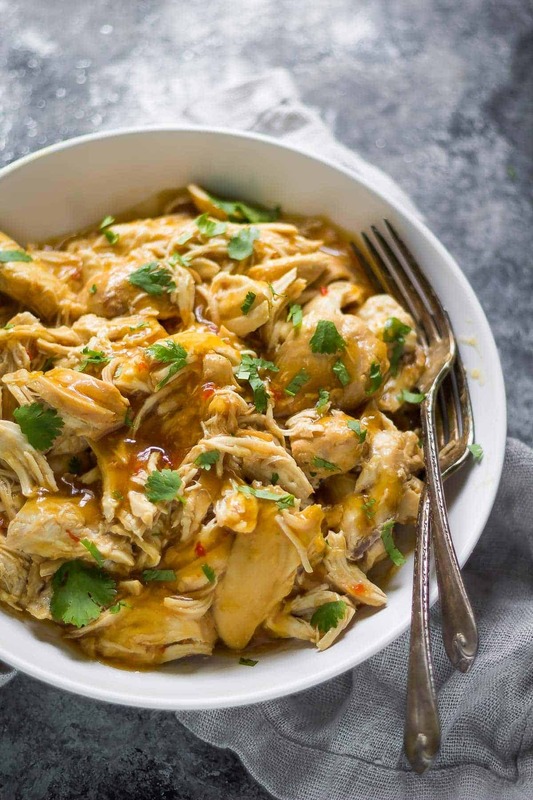 This SUPER simple slow cooker sweet chili chicken has just 6 ingredients! 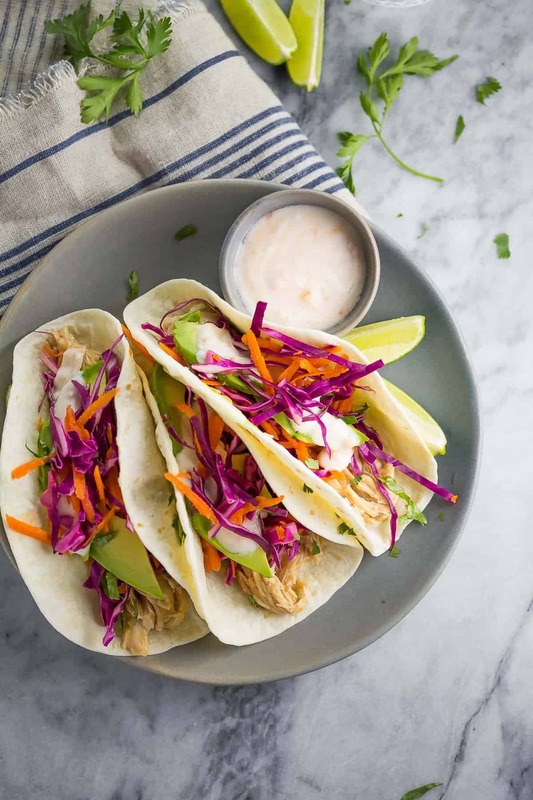 And this chicken makes a perfect base for so many recipes, including quesadillas, rice bowls and tacos. It has been so long since I last did a slow cooker 3-in-1 week! March to be exact! I am so happy to be sharing another one with you. 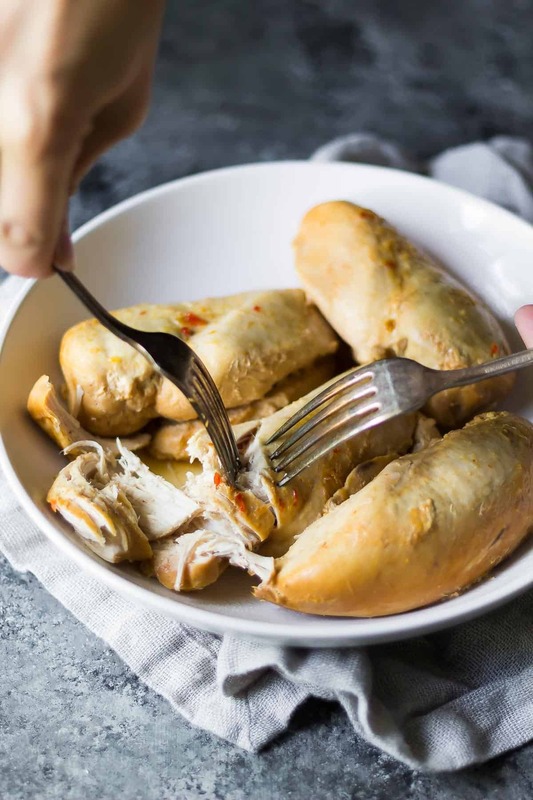 I thought it was time to share another chicken recipe (after sharing this slow cooker honey lime chicken way back last summer)…obviously chicken is SO versatile, and this slow cooker sweet chili chicken can be used in SO many other recipes. This chicken recipe couldn’t be any simpler! You just need FOUR ingredients to dump in the crockpot, set the timer and you’re good to go. 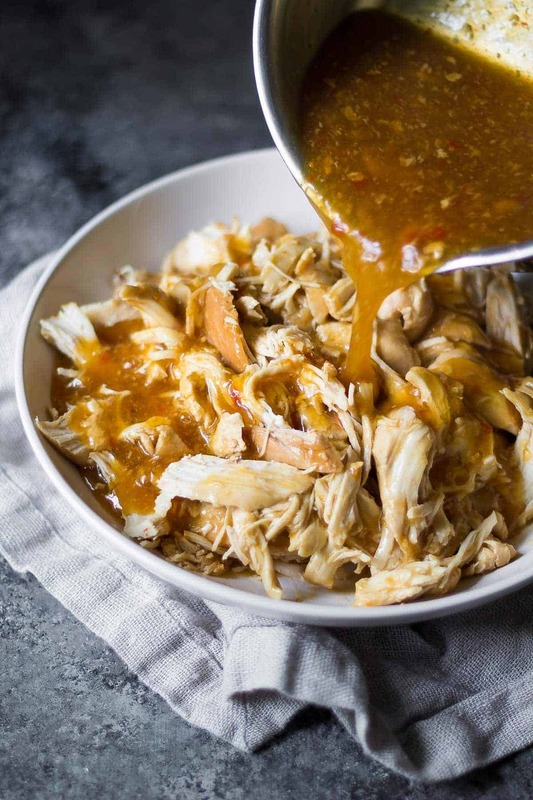 There is a teeny tiny bit of extra work at the end for this slow cooker sweet chili chicken recipe. I’ve mentioned before that I’m not really a fan of heavy sauce on my pulled pork, and the same applies to chicken and beef. But for this recipe I did want the sauce to be a little thicker, just so we get an extra dose of sweet chili flavor, so at the end, I brought the sauce to a boil with a little bit of cornstarch. Totally did the trick! More flavor, a bit saucier but not too saucy. If that makes any sense!! This pulled chicken is a bit sweet from the sweet chili sauce, and a bit salty from the soy sauce. Actually it’s very similar to my Sweet Chili Salmon recipe! It is great eaten as is, but even better in the recipes I’ll be sharing with you later this week! 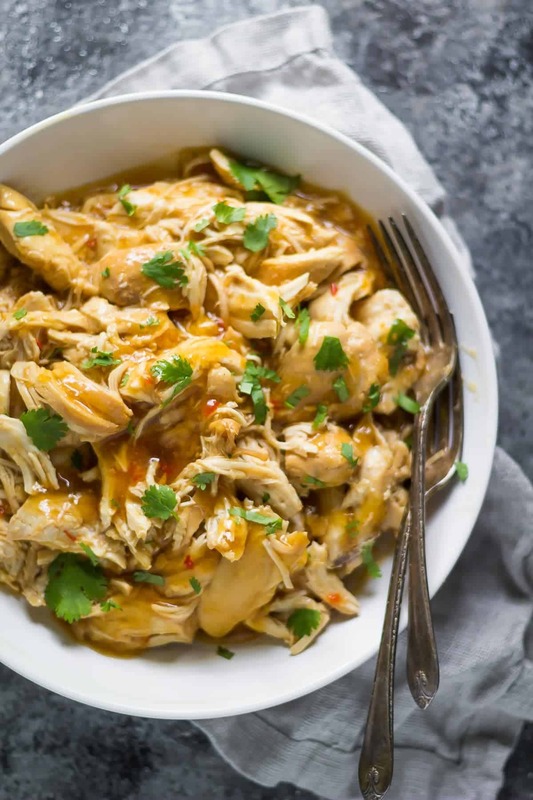 By taking the time to whip up this slow cooker sweet chili chicken on the weekend, you will set yourself up for weeknight dinner success: each of the recipes I am sharing this week are ready in under 30 minutes. And trust me: you’re NOT going to get bored of these recipes! Stir together the sweet chili sauce, chicken stock, salt and soy sauce in the base of a slow cooker. If you are using full sodium soy sauce, omit the salt, or taste and add if necessary before serving. 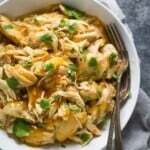 This recipe makes 6 cups of shredded chicken. Nutritional information is for 1/2 cup shredded chicken, roughly 3.5 oz or half a chicken breast. Can something vegetarian be substituted for the chicken? Tofu or one of the frozen fake meats? 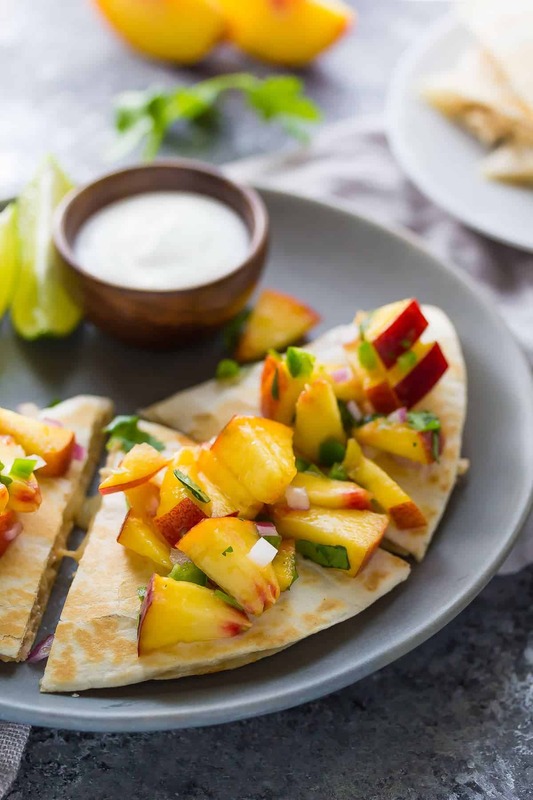 Love the peach salsa, so refreshing and delicious on burgers! Will try the quesadillas soon. Thanks SweetPea!!! Anybody tried this in the pressure cooker?? Can the chicken go in frozen? Hi Mary, I haven’t tried that, and have read that it’s not good to do that for food safety reasons. I would also worry you’d need to cook for longer and the sauce might burn. Hi there as this is only for one person can I freeze what’s left over? Sorry I’ve just seen your answer to someone that asked the same thing that’s great news! Have you had any success freezing the leftovers for this chicken? I’m only cooking for one and six cups of chicken is a lot for me to go through! 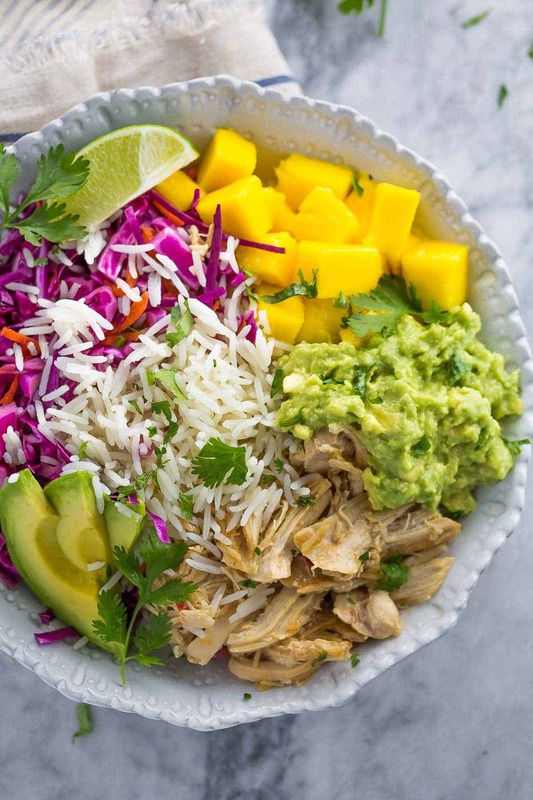 My crockpot is broken,can this delious looking dish be made in the oven? Hi Krista, I haven’t tried making this recipe in the oven, but I think if you use this recipe, swap the salmon for the chicken, and bake for 25 total minutes, it should work out. I also normally flip my chicken breasts after 10 minutes. I hope this helps! Thanks for reporting back, Miss Hazel! Hope you enjoy it! I am excited to try this recipe tonight! 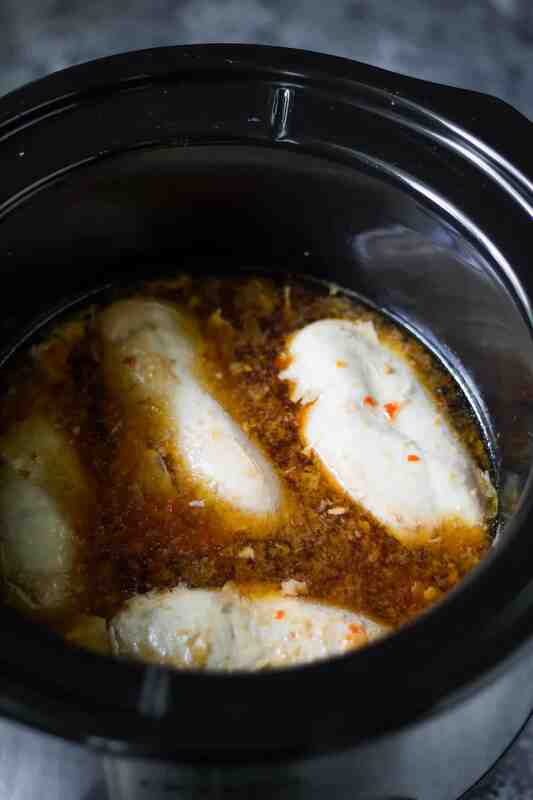 Does it really only take 3 hours on LOW setting in the crock pot to fully cook the 4 chicken breasts?? Hi Amber, yep! 3 hours on low and the chicken will be cooked through. How did it turn out for you? Hi there! I plan to make this for dinner tomorrow and I can’t find where you mention the heat setting (low or high) and how long to cook chicken in slow cooker. Can you please let me know? My family is looking much forward to giving this delish dish a try! Thanks ? Hi Jessica! It’s 3 hours on low. I don’t recommend cooking much longer or on a higher heat setting because I did have issues with the sugar in the sauce burning when I was testing the recipe for longer/higher heat 🙂 Hope you like it! Hi Samantha, did you see the 3 recipes that I made with the chicken? Otherwise you could put it on a salad, or in enchiladas, or just eat it as is with some veggies and rice. It’s really versatile! I don’t have the means to make the sauce thicker after cooking in the crockpot (we are camping) so can I reduce the amount of chicken stock to thicken it up? Hi Alexis! I initially tried thickening the sauce right in the crockpot and I think if I’d had more time it would have worked. I would try adding the cornstarch + water right to the slow cooker and crank it up to high for half an hour or so. I did this in a recipe I haven’t published yet and the sauce did thicken, with about the same amount of liquid, so I think it would work for this recipe as well. I hope that helps! This is delicious! I made the chicken and served it over beans and rice. Tasty and frugal! Yay! I’m so glad you liked it, Ami. Thanks so much for reporting back! My crockpot is broken,can I make this in the oven? On what temperature? 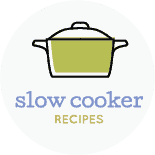 I love this slow cooker recipe!! We keep sweet chili sauce in the house for Korean fried dumplings and have never thought to use it for anything else. I must make this for my husband soon! This chicken looks delicious, Denise — that sweet chili flavor sounds fantastic! All three meals look great and can’t wait to see them up close and personal. 🙂 I’m loving your bowl, gray plate, and dish towel too — you’ve got some gorgeous props going on!